COP23 raised thoughtful and innovative discussions surrounding the many issues of the energy-water nexus. While there were few large decisions or policies made addressing energy and water, there were several important outcomes that will be key in reaching the goals set for these resources and responding to related Sustainable Development Goals (SDGs). SDG 6 addresses water and sanitation, prioritized in many countries’ climate action plans submitted under the Paris Agreement. However, water agencies at COP23 estimated that $295 billion (USD) would be needed for countries to fully develop water management strategies and take action as part of adaptation to climate change—a number that is three times the levels of investment prior to COP23. The EIB pledged $75 million (USD) toward a $405 million Fiji investment program to strengthen resilience of water distribution and wastewater treatment following Cyclone Winston. The International Energy Agency launched the Clean Energy Transitions Program, a multi-year $30 million (EUR) plan that was backed by 13 countries at COP 23 to support clean energy transitions around the world. Many other outcomes that emerged from COP23 relate to or are reliant on proper management of energy and water resources. One such event was the launch of the global Powering Past Coal Alliance—formed to declare a phase-out of coal—led by the UK and Canada, and joined by more than 20 countries and other groups. Unfortunately, emissions rose this year after holding steady for three years, due to increased use of fossil fuels. 28 July 2017, Nepal- Village of Bhagawoti Kauledhara. Farmers’ Field School female members working in the fields trying new agricultural techniques. Leaders agreed that investing more in agricultural climate action and supporting sustainable livelihoods of small-scale farmers will unlock much greater potential to limit emissions and protect people against climate change. 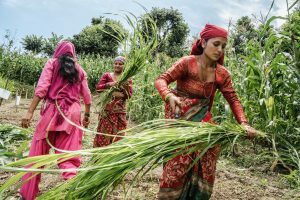 The UN’s Food and Agriculture Organization (FAO) released a new Sourcebook on Climate-Smart Agriculture with guidelines to scale up public and private climate financing for agriculture, encourage partnerships, and build capacity. Overall, COP23 was quite focused on setting the stage for COP24, which will hopefully see adoption of the Paris Rulebook. Great strides were achieved for the issues of the energy-water nexus and how they relate to climate change. Not only were these issues brought up more frequently in discussions across the COP, but also steps are being taken to integrate concepts and promote collaboration on these issues across many organizations, countries, and disciplines.